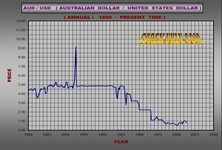 We have annual data tables and charts of Gold and Crude Oil dating from the year 1800 to present time. The information presented in our products has been derived from end-of-the-year closing prices of Gold and Crude Oil (monthly charts were derived from end-of-the-month closing prices of Gold and Crude Oil). ZIGZAG (UP) from 1800. In our annual data table and chart, we indicated predicted price of Crude Oil from the year 1800 to the year 1920 and the actual price of Crude Oil from the year 1920 to present time. Last form on the chart: FLAT (UP) from 1800. 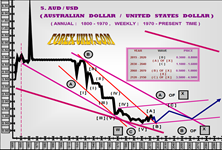 Also, we have annual charts of Gold and Crude Oil with forecasting future flow rate (Versions “A”, “B”, “C”) for the next 100 years (to 2100), and monthly charts of Gold and Crude Oil with forecasting future flow rate (Versions “A”, “B”, “C”) for the next 50 years (to 2050). Prices for all precious metals and minerals depend on the Gold and Crude Oil rates. Future flow rates of Gold dictate the general rate of flow for all other metals. For example, Silver, Copper, and Platinum rates will rise when the price of Gold increases. On the contrary, when the rate of Gold falls, Silver, Copper, and Platinum rates will fall as well. The future flow rates of Crude Oil show the general flow rate for all other valuable minerals. For example, Gas, Coal, or Iron Ore rates will grow when the Crude Oil rate increases. Vice versa, those rates will decrease when the rate of Crude Oil goes down. By familiarizing yourself with future flow rates of Gold and Crude Oil in the 21st century, you will know the general direction of flow rates for all precious metals and minerals for 100 years in advance. Historical data table of current end-of-the-year closing prices of Gold or Crude Oil dating from the year 1800 to present time. 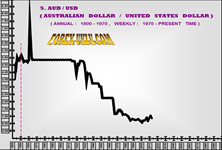 (Example of AUD/USD are located below for your convenience). Table “The Impact of Gold and Crude Oil Value on the Value of Precious Metals and Minerals”. 1. Historical data table of current end-of-the-year closing prices of Gold or Crude Oil dating from the year 1800 to present time. 2. Table “The Impact of Gold and Crude Oil Value on the Value of Precious Metals and Minerals”. 3. Annual flow rate chart of Gold or Crude Oil dating from the year 1800 to present time (Types “A”, “B”, “C”). 4. 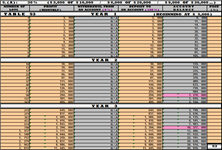 Monthly flow rate chart of Gold or Crude Oil dating from the year 1980 to present time (Types “A”, “B”). 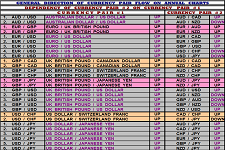 (Examples of AUD/USD are located below for your convenience). next 100 years (to 2100). 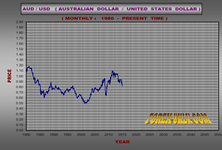 (Example of AUD/USD are located below for your convenience). 5. Monthly flow rate chart of Gold or Crude Oil dating from the year 1980 to present time (Types “A”, “B”). 6. 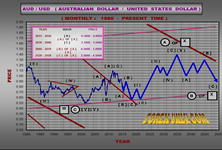 Monthly flow rate chart of Gold or Crude Oil with Elliott Wave Analysis and forecasting future flow rate for the next 50 years (to 2050). 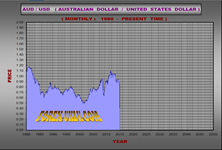 Data tables and charts of Gold and Crude Oil look the same as our data tables and charts for currency pairs. You can see their examples at our Home page. You can adjust the values along the “X” and “Y” axis at our charts. Please see instructions on how to adjust the axis at our page Contact Us. How to Subscribe section on our website. We will send you your order within two business days. Sixty-two tables with predictions for 15 years showing monetary gains with respect to varying monthly income (10%, 15%, 20%, 25%, 30%) and with varying amount of lots. We own valuable information relating to increased gains from trading currency at the global market. 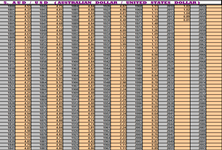 This information is presented in 62 tables. The tables guide their user in proper planning and strategic trading techniques for maximum monetary gains and an insight into the future of foreign currency trading. Each of these tables have been created in a spreadsheet and all of them are divided into 15 separate categories. Each category can be used for up to 15 years or up to the sum of $ 100,000,000,000. The full listing of these categories can be found in the table titled “Financial Plan“ (Table 62). You can chose one of these 15 options to suit your preferences. Using the option chosen you can get a perspective of your income 15 years in advance. Examples are shown below under “Financial Plan” (Tables 1, 6, 11, 16, 20, 25, 30, 33, 37, 42, 45, 48, 53, 55). An increase in the amount of lots with respect to the monetary amount in your account. 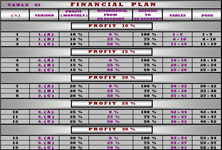 The monetary gains at various monthly returns on income (10%, 15%, 20%, 25%, and 30%), and with various amounts of lots. The amount of money received each month after 25% or 50% deductions from your income. The amount of money added each month to your account after 25% or 50% deductions from your income. The amount of monthly increase in your account at various monthly returns on income (10%, 15%, 20%, 25%, and 30%), and with various amounts of lots. Sixty-one tables with predictions for up to 15 years relative to monetary gains depending on income and the number of lots. An informative table showing 15 different outcomes depending on the amount of income. Please note, the image resolution of our examples displayed above has been reduced in quality. The actual product resolution is of much higher quality. a) The exact monetary amount transferred to our account. b) Payment method used (Bank transfer, Personal check, Money order, Pay Pall or Web-Money). c) The type of service requested (in this case Financial Plan). d) The name and e-mail address of the requestor (for private sector) or the name of a business organization. As soon as payment is confirmed your tables will be sent to your e-mail address as an attachment.